Photographer / Light painter Patrick Rochon (previously) released something that is on the intersection of photography and general art. The series is called Radiant Light and it was created using tools that Patrick designed. You know that light is invisible until it touches something. 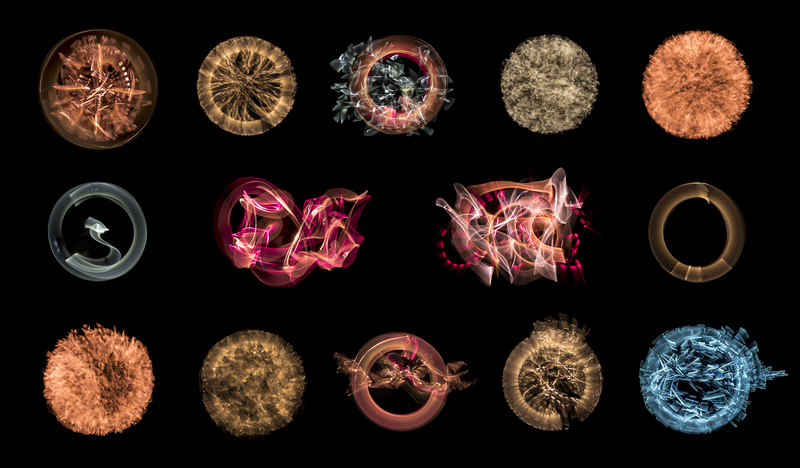 Sounds like our voice, have the most amazing shapes as we can see with cymatics. The work of Dr. Masaru Emoto shows us that we are directly influencing and shaping our surrounding through our intentions. The planets in relationship to one an other, moves in beautiful patters similar to sacred geometry. I play with light in the dark, it’s called light painting. I imagine all the beauty and keys that lies beyond what we see with our eyes. I experiment with consciousness to discover the greater intelligence that creates us all. The Radiant Light exhibition is an artistic interpretation of what shapes our reality of all forms of energy invisible to the naked eye, but more real than you and me. Most of what shapes reality is unseen. The series is exhibiting at Endeavour Gallery in Calgary until May 3rd. Well thank you Jared for this great comment, it is a lot of work to get there but pushing our self’s boundaries is like traveling in unknown countries. It’s an adventure filled with surprises.